Try to get near football's best known trophy these days and you might find yourself accosted by several large and intimidating men dressed in black. Save for organised picture opportunities, the FA Cup is heavily guarded - such is the history and sentimental value that surrounds it. When Portsmouth were handed the trophy by King George VI after beating Wolves 4-1 in the 1939 final, little did they realise they would become its custodians for the next seven years. While World War II raged, the competition was suspended and the FA Cup began a slow tour of Portsmouth and the surrounding area. Slow because after a short period at Fratton Park, the FA Cup took pride of place at the Bird in Hand pub in Lovedean for two years. Joan Wilkinson' father was landlord at the time and she remembers his role in guarding the trophy. "It used to sit on top of a radio behind the bar," she said. "Father took his role very seriously. At night it could not be downstairs so it would go under the bed." While Portsmouth, home to the Royal Navy, was targeted by the Luftwaffe, rural Lovedean just north of the city would have been as safe a place as any to keep the trophy. The grandfather of Portsmouth historian Richard Owen also played a part in keeping it safe. "My grandfather was a fire watch during World War II," said Mr Owen. "There was an air raid in Elm Grove where the cup was in a shop window. "It was quickly taken out by some local people and taken to a pub in Albert Road where it went down into the cellar and my grandfather looked after it with a couple of other people. 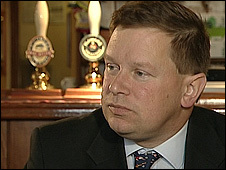 "There was an awful lot of trust during the war among Portsmouth people. "It was kept in all sorts of unusual places, but safe places because of the bombing that was going on overhead - it was moved around because of the concern of it being damaged. "The fact we held it for seven years gave it the opportunity to go around the city. It boosted moral and kept Portsmouth people going." Other sites where the cup is known to have been held include Havant police station and a bank. The cup did pick up a few bumps and scrapes along the way - most notable at the hand of Pompey's Bert Barlow. The inside left had joined Portsmouth from fellow finalists Wolves earlier that season. And after scoring in the final he no doubt had more celebrating to do than most. "Bert Barlow took it to South Parade pier to a function where he had a few too many," said Mr Owen. "When he came out he dropped it down the steps and into the road. "He took it to a silversmith in Queen Street and the damage cost £70 to get the dents out - he was only earning £7 a week." "No one knew anything about it at the time," added Mr Owen, who only learnt of the story from Barlow in the 1980s. Barlow died in 2004 aged 87. Portsmouth relinquished control of the famous trophy when professional football resumed after the war finished. 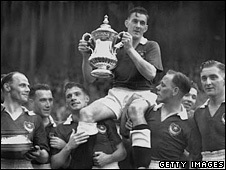 Derby County became the new holders of the cup when they beat Charlton in the 1946 final. Should the FA Cup return to the south coast city for the first time since the war, could it return to familiar surroundings? 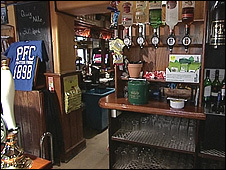 Lisa Harris, the current landlady at the Bird in Hand, said few people were aware of its association with her pub. "The locals are really proud of it but not many people know that it was here," she said. "It would be nice for the locals to see the cup come back." Portsmouth Expects: A South Today Special previewing the FA Cup final, can be seen at 1900 BST on Friday, 16 May on BBC1 in the South.